Six million Jews were killed by the Nazis and their collaborators during the Holocaust, wiping out a third of world Jewry. Israel’s main Holocaust memorial day is in the spring — marking the anniversary of the Warsaw Ghetto uprising. The United Nations designated Jan. 27 as the annual international commemoration, marking the date of Auschwitz’s liberation in 1945, the day Feivlovich turned 18. 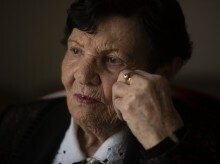 “The Nazis are teasing us, spitting on us and watching us there miserable,” she said. “I’m holding my sister’s hand, and we are shaking and crying and I ask: ‘Is this possible?’” she remembered. By the time Auschwitz was liberated, she had already been transported to forced labor in a German armament factory. Even there she wasn’t safe. The camp commander ordered her to receive a mysterious injection for talking back and refusing to make the Christian sign of the cross on herself. Feivlovich said in recent years her birthday has become “obligating,” particularly since her husband passed away in 2007.